Sculptor Cathy Keil serves as vice president of the Placerville Arts Association, an organization she attributes to making her an even better artist. “Involvement in arts organizations gives artists an opportunity to participate in shows and [exhibit] their art in front of the public,” shares Keil. 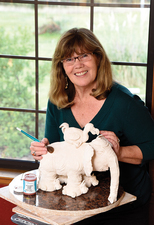 “As members, artists can also sign up for classes geared to their specialty, [and] a whole new world is opened with unimaginable opportunities.” Keil displays her whimsical, often animal-themed ceramics at Placerville’s Flowers on Main, as well as Sacramento’s Archival Gallery and Roseville’s Blue Line Arts. HLB: When did you discover ceramics? CK: When I retired, I made a list of classes I wanted to take at Folsom Lake College: first was horticulture, followed by creative writing, then came ceramics. [It was in the latter course] when I found my passion and consequently stayed for four semesters. I never did finish my list! I love the feel of clay in my hands; I’m amazed at the transformation and what it can become. The piece is already in that clay mass—I just have to uncover it. HLB: How do you determine a theme? CK: I let the clay guide me. I find that whimsy allows for a greater form of expression. I can be working on a piece and he/she may stick their tongue out. I say, “really?” but pretty much go along with who they want to be. I’ve sculpted a variety of animals; they are all goofy and seem to take on a life of their own! HLB: Why are arts organizations essential? CK: As a member, my relationships have taken me into a world I never dreamed I’d be in. Being part of this great group has given me lifelong friendships. We artists encourage one another; and we also critique each other’s work—all the while sharing a wealth of ideas. There is a bond between us artists that doesn’t exist anywhere else. I’m a better artist because of my friends. HLB: Have you ever suffered from artist's block? CK: Oh yes! The best remedy for that is to walk away, relax, and do something else. Let your mind do the work—you’ll be surprised. HLB: Do you visit any local spots for inspiration? CK: American Visions Gallery in Historic Folsom is a great place to get inspired. They have Tod Warner’s art, and I laugh every time I see it. Placerville’s Flowers on Main is another place I go; Melissa has done a wonderful job presenting her business as an art gallery, in addition to being a flower shop. CK: Find your passion, learn the techniques, and jump in with both feet. I believe that these elements, along with patience and practice, will guide the budding artist anywhere they want to go. The art doesn’t have to be perfect, and the artist can’t create art for the public in the hopes that it will sell. The art has to be an expression of the inner artist. Take classes at a local college to learn the techniques. You’ll find that your knowledge of art doesn’t stop at the classroom door, however; it’s ongoing—it’s called living.